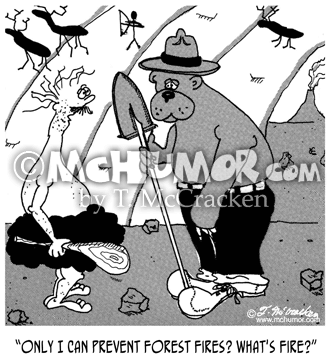 Fire Cartoon 5029: A caveman asking Smokey Bear, "Only I can prevent forest fires? What's fire?" 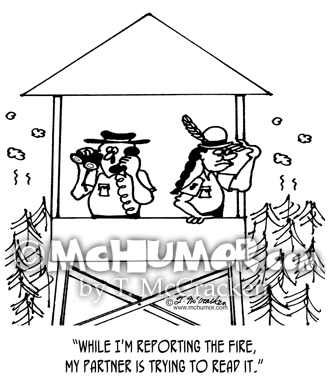 Fire Cartoon 3390: A forest ranger on the phone in a fire tower with an Indian says, "While I'm reporting the fire, my partner is trying to read it." 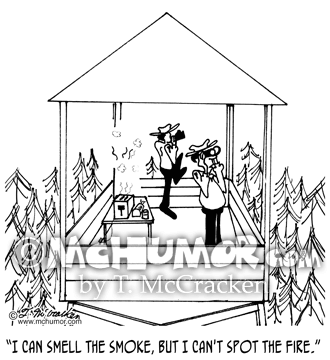 Fire Cartoon 3385: A ranger in a fire tower looking out at the forest with a pair of binoculars says to another, "I can smell the smoke, but I can't spot the fire." They don't realize their toaster is on fire. 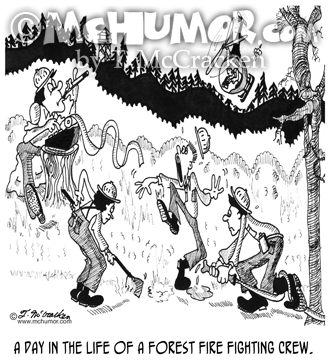 Fire Cartoon 3603: "A day in the life of a Forest Fire Fighting Crew." A crew member is tangled up in a fire hose, another hops around with a burnt foot, another digs fire line, a helicopter falls overhead and one does calculations. 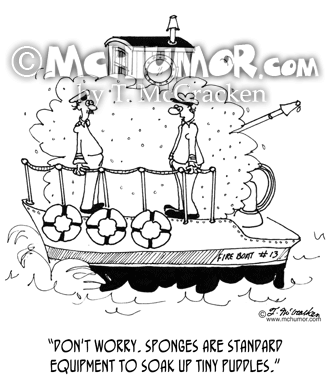 Fire Cartoon 4067: "Studying Fire Behavior." 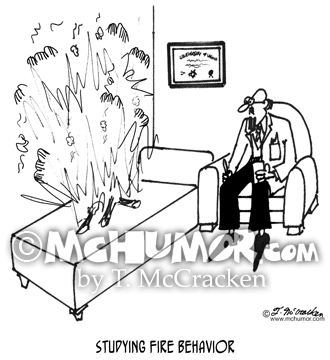 A fire burns on a psychiatrist's couch. 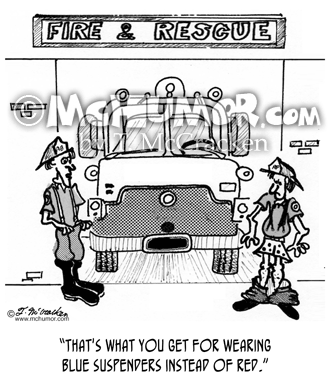 Fire Cartoon 1754: A fireman saying to one whose pants have fallen down, "That's what you get for wearing blue suspenders instead of red." 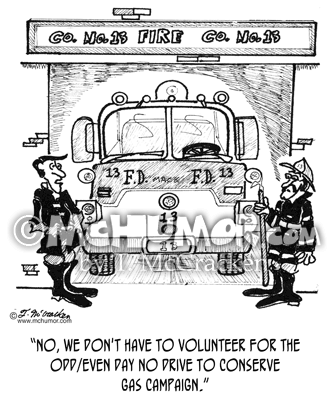 Fire Cartoon 1620: A fireman in front of a fire truck says to another, "No, we don't have to volunteer for the Odd/Even Day No Drive To Conserve Gas Campaign." 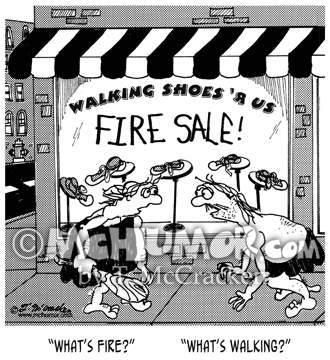 Walking Cartoon 4918: Two Neanderthals standing in front of a store, "Walking Shoes 'R Us," which is having a "Fire Sale." One asks, "What's fire?" 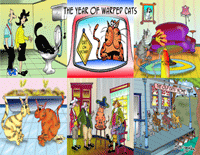 The other asks, "What's walking?" 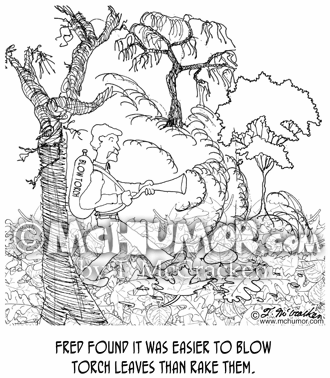 Fire Cartoon 0669: A man with a blow torch in the woods says, "Fred found it was easier to blow torch leaves than rake them."